Transforms Your Water Into A Heat Transfer Fluid! H2O Catalyst functions as an "anti-boil" colligative agent which actually raises the boiling point of water in your melting tank. High Altitude Suitable! By raising boiling point of water, H2O Catalyst makes working with a water jacket melters at high altitudes a breeze. 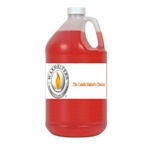 WaxMelters' H2O Catalyst has a proprietary inhibitor system for use in most water jacket melters, melting tanks and double boilers which prevents corrosion, prevents the growth of bacteria and maximizes the life of your heating element. Non-Hazardous so No EPA Reports or Permits needed for use. Does not contaminate water and flushable to sewer and septic systems. All ingredients are listed as generally regarded as safe (GRAS) per FDA/USDA guidelines. All ingredients are on the FDA list for approved food additives. Transform Your Water Into A Heat Transfer Fluid Today! Makes Candle Wax Melting Faster & Easier!